The National Reconnaissance Office successfully launched its GeoLITE (Geosynchronous Lightweight Technology Experiment) advanced demonstration satellite from a Boeing Delta II rocket May 18 at 1:45 p.m. from Cape Canaveral AFS, Fla. The GeoLITE satellite has a laser communications experiment and an operational UHF communications mission on board. GeoLITE was built by TRW of Redondo Beach, Calif. 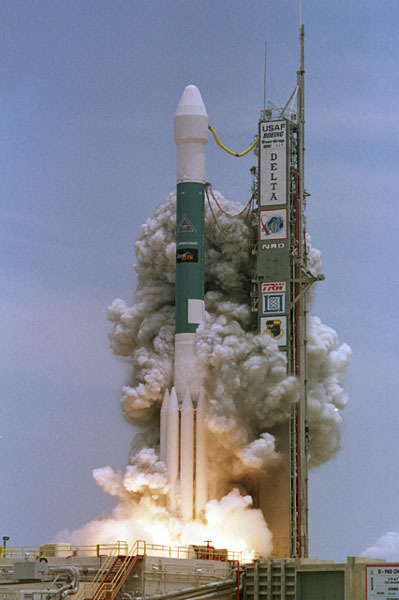 This was the first time an NRO satellite was launched aboard a Delta II rocket. "I am very proud of the fantastic work done by our NRO government-contractor team," said Col. Stephen Wojciki, director of the NRO's Office of Space Launch and mission director for this launch.